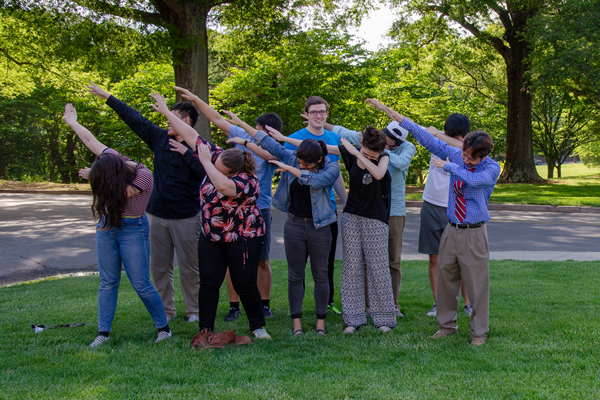 Group Picture, 2018: (left to right, back) Manal, Smiti, Caroline, Lauren, (left to right, front) Daniel, Haoze, Sajant, Kedi, Sam, and Meijian. 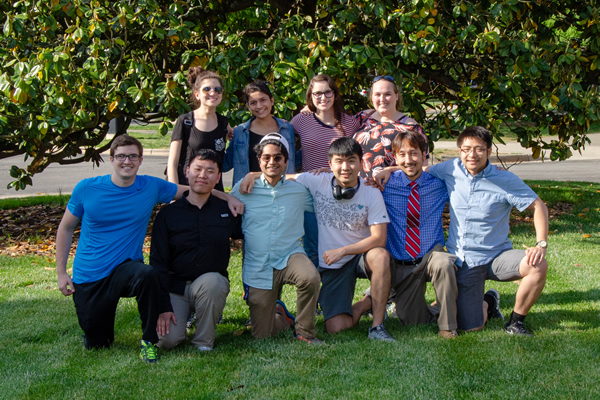 Group Picture, 2018: (left to right, back) Haoze, Meijian, Daniel, Sajant, Kedi, (left to right, front) Caroline, Lauren, Smiti, Manal, and Sam. 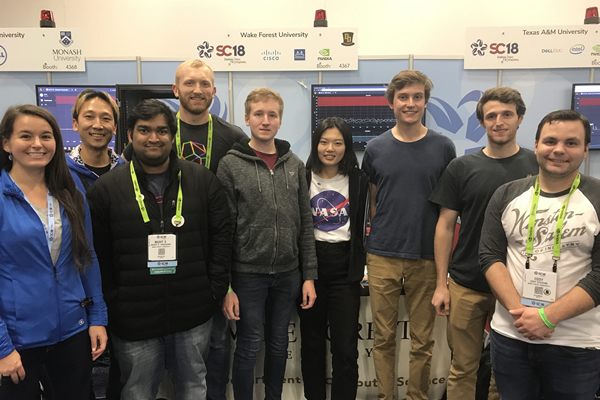 Inaugural Student Cluster Competition Team, 2018: (left to right) Christine, Sam, Mudit, Adam, Paul, Vera, Matteo, Mitch, and Cody. 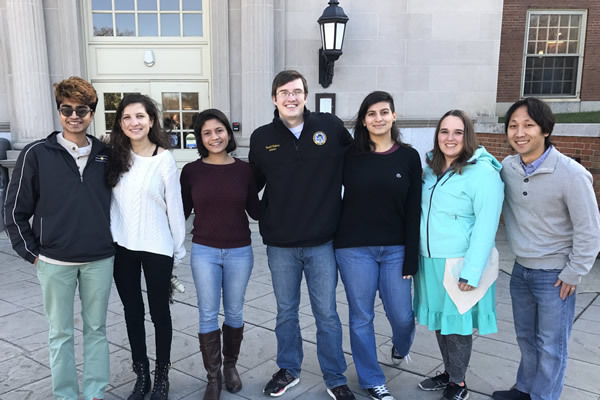 Group Picture, 2016: (left to right) Sajant, Manal, Smiti, Daniel, Melisa, Lauren, Sam. Group Picture, 2015: (left to right) Julian, Cecilia, Rongzhong, Sam, Billy, Lauren. 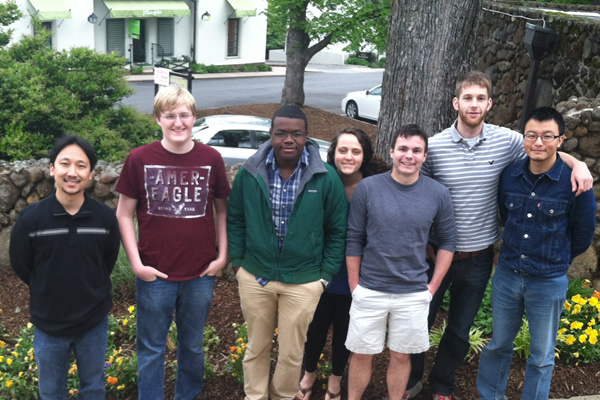 Group Picture, 2014: (left to right) Sam, Billy, Jessica, Cody, Cecilia, Adam, Rongzhong. 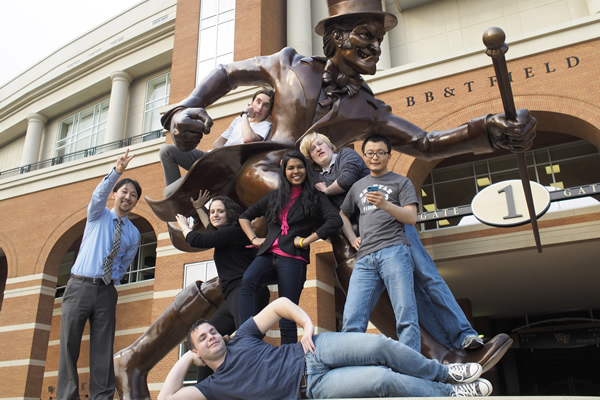 Group Picture (Wake Forest Shake version), 2014: (left to right) Sam, Cody, Jessica, Billy, Cecilia, Adam, Rongzhong. 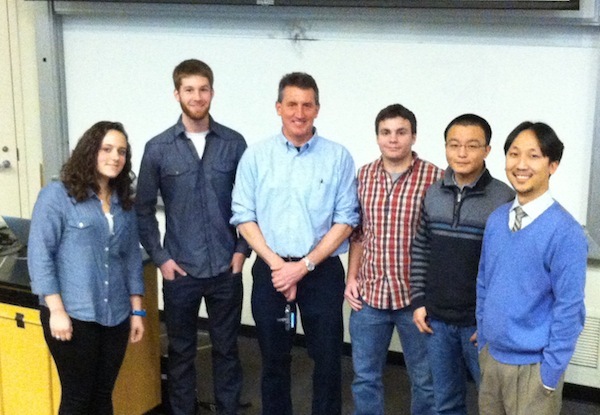 Alex Mackerell Colloquium, 2013: (left to right) Jessica, Andrew, Alex, Cody, Rongzhong, Sam. 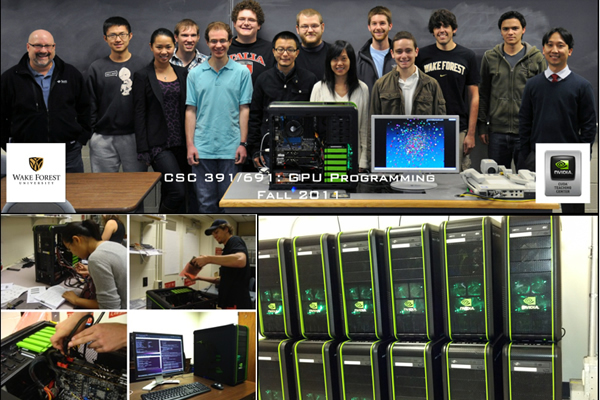 Inaugural GPU Programming Class, 2011. Inaugural Google CS4HS Computational Thinking @ Wake Workshop for Teachers, 2012. Group Picture, 2013: (left to right) Sam, Adam, Julian, Jessica, Cody, Andrew, Rongzhong. Group Picture, 2012: (left to right) Andrew, Paul, Tyson, Sam, Rongzhong, Anqi. May, 2018: Sajant receives the William C. and Ruth N. Archie Award, which is given each year "to the graduating senior who has shown most conspicuously a commitment to liberal learning, to scholarship, and to the ideals of Wake Forest College." May, 2018: Sajant receives both the Speas Award and the Sawyer Prize for being the top student in the Physics and Computer Science Depts., respectively. May, 2018: Caroline successfully defends her Physics Dept. Senior Thesis. May, 2018: Manal successfully defends her Physics Dept. Senior Thesis. May, 2018: Kedi successfully defends his Computer Science Dept. Senior Thesis. April, 2018: Meijian successfully defends his Computer Science Dept. Master's Thesis. April, 2018: Sajant successfully defends his Computer Science Dept. Senior Thesis. October, 2017: Smiti is the founder and first President of Women in Computer Science (WiCS) (link), a new Computer Science Dept. student organization. October, 2017: Smiti profiled by Old Gold and Black, Wake Forest University's Student Newspaper (link). September, 2017: Sajant receives the Upsilon Pi Epsilon (Computer Science Honor Society) Scholarship. Undergraduates Program (link), one of only 34 students selected. She will attend the internationally attending leading supercomputing SC17 conference in Denver, CO (link). August, 2017: Melisa is interviewed by Science News for Students in an article about why we need more minorities in STEM (link). August, 2017: Melisa and Manal are profiled by Wake Forest News in an article about supporting women and minorities in STEM (link). August, 2017: Haoze joins the group. Welcome! August, 2017: Meijian joins the group. Welcome! July, 2017: Caroline is awarded a Wake Forest University Center for Molecular Communication and Signaling Research Fellowship (link). July, 2017: Caroline joins the group. Welcome! May, 2016: Smiti received the Anita Borg Scholarship to attend the Grace Hopper Celebration (link), the world's largest technical conference for women in computing, in October at Orlando, FL. April, 2017: Lauren is selected as a speaker at the Second Molecular Biophysics Symposium at Virginia Tech (link). March, 2017: Sajant received an honorable mention for the Goldwater Scholarship (link). March, 2017: Sajant has been accepted to Harvard University's SEAS NSF REU Summer Research Program (link) this summer. March, 2017: Manal is featured in Spectrum News in a segement on gender diversity in STEM (link). March, 2017: Ronzhong's and Cody's review Book Chapter, "MD Simulations of Biocorona Formation" is published by Springer Publishing in the book, "Modeling, Methodologies and Tools for Molecular and Nano-scale Communications" (link). March, 2017: Manal is profiled by Wake Forest News in an article about receiving her travel award to the internationally attended Biophysical Society Meeting (link). March, 2017: Manal and Melisa are profiled by Wake Forest News in an article about gender diversity in STEM (link). January, 2017: Smiti will have an internship at Verisign, the internet security firm, this summer (link). January, 2017: Kedi joins the group. Welcome! November, 2016: Melisa has accepted a position at Google's Engineering Residency Program (link). November, 2016: Manal received the Biophysical Society Meeting Committee for Inclusion and Diversity (CID) (link) Travel Award and Education Travel Award (link) (declined) to attend the 61th Annual Biophysical Society Meeting in February 2017 in New Orleans, LA in February 2017 (link). September, 2016: Smiti joins the group. Welcome! July, 2016: Sam is officially tenured and promoted to the rank of associate professor. Time to get back to work. June, 2016: Melisa received the Anita Borg Scholarship to attend the Grace Hopper Celebration (link), the world's largest technical conference for women in computing, in October at Houston, TX. May, 2016: Julian is interviewed by the New York Times (link) about his job search. May, 2016: Julian is profiled and interviewed by Wake Forest News for Commencement for "Senior Profiles" (link). April, 2016: Julian will be a chief of staff intern at Tech 2000 (link) over the summer. April, 2016: Jessica will be attending the University of Michigan, Department of Chemistry (link) in their Ph.D. program in the Fall. April, 2016: Melisa attended the Computing Research Association Women Grad Cohort Workshop in San Diego, CA (link). March, 2016: Melisa will be interning with InMar, an intelligent commerce network company, over the summer (link). January, 2016: Melisa joins the group. Welcome! November, 2015: Manal received the Thomas E. and Ruth Mullen Scholarship. Applicants must be at least in the top 10% of the class to apply. Of the applicants, 20 finalists compete in a group interview to select the final receipient (link). October, 2015: Julian has accepted a position as a synthetic equity trader at UBS at their New York office (link). September, 2015: Billy has accepted a position as a Specialist at Americorps (link). August, 2015: Sajant joins the group. Welcome! August, 2015: Daniel joins the group. Welcome! July, 2015: Ronzhong and Jessica's review article, "MD Simulations of tRNA and Aminoacyl-tRNA Synthetases: Dynamics, Folding, Binding, and Allostery" is published in Int. J. Mol. Sci. 's special issue "Functions of Transfer RNAs" (link). June, 2015: Lauren receives an NIH NRSA Predoctoral Fellowship. June, 2015: Julian's paper, "Concurrent Solutions to Linear Systems using Hybrid CPU/GPU Nodes" is published in SIAM Undergraduate Research Online (link). May, 2015: Cecilia accepts a position as a Project Cordinator at the Wake Forest Institute for Regenerative Medicine (link). May, 2015: Billy successfully defends his Physics Dept. Senior Thesis Defense (link). April, 2015: Rongzhong's paper, "A True Random Number Generator algorithm from digital camera image noise for varying lighting conditions" is published in IEEE SoutheastCon 2015 (link). April, 2015: Rongzhong successfully defends his Physics Dept. Ph.D. Defense (link). March, 2015: Manal is awarded a Wake Forest Research Fellowship (link). March, 2015: Rongzhong presents his talk titled, "A Real Random Number Generator Algorithm From Digital Camera Image Noise For Varying Lighting Conditions", at the North Carolina Academy of Sciences Annual Meeting (link). March, 2015: Sam presents his talk titled, "GPU-Optimized Algorithms for Coarse-Grained MD Simulations of Protein-Nanoparticle Biocorona Formation", at the NVIDIA GPU Technology Conference in San Jose, CA (link). 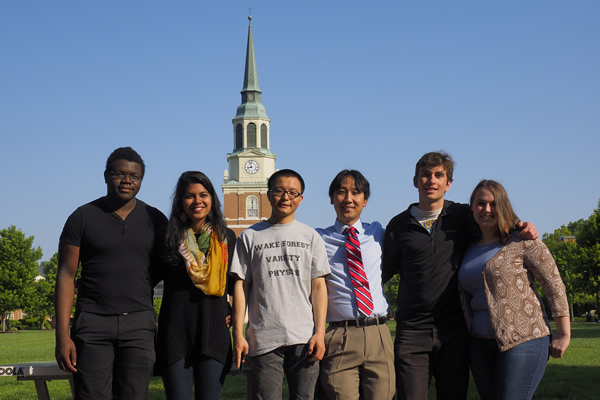 February, 2015: Rongzhong receives a Summer Research Support from the Wake Forest University Graduate School (link). February, 2015: Julian receives a travel grant from URECA to present his paper at the SIAM Conference on Computational Science and Engineering (CSE15) (link) in Salt Lake City, Utah. October, 2014: Billy receives the STARR Travel Grant (link) to attend the Biophysical Society Meeting in Baltimore, MD (link). October, 2014: The review paper by Jessica, Adam, Julian, and Cecilia in the Israel Journal of Chemistry commemorating the 2013 Nobel Prize in Chemistry is profiled by Wake Forest News (link). September, 2014: Cecilia receives the STARR Travel Grant (link) to attend the Biophysical Society Meeting in Baltimore, MD (link). September, 2014: Julian's paper from his research with the NSF REU program over the summer has been accepted to the SIAM Conference on Computational Science and Engineering (CSE15) (link). September, 2014: Manal joins the group. Welcome! September, 2014: Lauren joins the group. Welcome! June, 2014: Sam was an invited speaker at the Kavli Institute for Theoretical Physics China at the Chinese Academy of Science for a program on Macromolecular dynamics: structure, function and diseases (link). He was also an invited speaker at the Institute of Biophysics (link) at Nanjing University (link), ranked #1 in Physics in China. June, 2014: Wake Forest News article about Jessica's research is one of the top research highlights from the 2013-2014 academic year (link). May, 2014: Adam is profiled with Sam by Wake Forest News for Commencement News for "Meaningful Mentoring" (link). May, 2014: Jessica is profiled and interviewed by Wake Forest News for Commencement for "Senior Profiles" (link). May, 2014: Jessica's, Adam's, Julian's, and Cecilia's review article, "Coarse-Grained and Atomistic MD Simulations of RNA and DNA Folding", is published in Israel Journal of Chemistry's special issue commemorating the 2013 Nobel Prize in Chemistry (link). May, 2014: Billy joins the group. Welcome! April, 2014: Sam received the Shively Family Faculty Fellowship Award for "outstanding record of teaching and scholarship" (link). April, 2014: Jessica presented her senior honors thesis titled,"MD Simulations of a Refined Modeled MetRS:tRNAfMet Complex", to the Department of Chemistry. April, 2014: Jessica has been accepted into the Kupcinet-Getz International Science School (Israel) (link) where she will be performing research in the group of Yaakov Levy (Weizmann Institute of Science, Department of Structural Biology) (link). April, 2014: Cecilia is awarded a Wake Forest Research Fellowship (link). March, 2014: Adam will be attending University of Tennessee, Knoxville (UTK) Department of Biochemistry and Cellular and Molecular Biology (link) in their Ph.D. program in the Fall. In addition, he is the recipient of the Chancellor's Fellowship from UTK, which is reserved for the top applicant into the program. March, 2014: Julian has been accepted to University of Maryland's NSF REU (Research Experiences for Undergraduates) in Interdisciplinary Program in High Performance Computing (link) this summer. He was one of 12 students accepted into the program out of over 100 applicants. March, 2014: Rongzhong has been accepted to the M.S. program in the Department of Computer Science here at Wake Forest University. When he graduates next year, he will have two graduate degrees: Ph.D. in Physics and M.S. in Computer Science. February, 2014: Cody's poster entitled, "GPU Optimized Allosteric Communication Network Analyses of Molecular Dynamic Simulations", is competitively selected for presentation at the GPU Technology Conference in San Jose, CA (March, 2013) (link). February, 2014: Jessica's research project and her presentation at the 552nd WE-Heraeus Seminar (link) at the Karlsruhe Institute of Technologie (Germany) (link) is profiled by Wake Forest University (link). February, 2014: Sam's paper with Paúl Pauca (WFU Dept. Computer Sci. ), Denise Johnson (WSSU Dept. of Education), Yu'Vonne James (Hanes Magnet School) entitled, "Computational Thinking for the Rest of Us: A Liberal Arts Approach to Engaging Middle and High School Teachers with Computer Science Students." is accepted for publication in Proceedings of the Society for Information Technology and Teacher Education (link), and it is profiled by Wake Forest University (link). January, 2014: For the second year in a row, the Huffington Post (link) selects Wake Forest University as one of the "Top 10 Colleges for Tech" and specifically highlights our Computational Thinking @ Wake Workshop. Woohoo! October, 2013: Martin Karplus (Sam's undergraduate advisor's (Alex Mackerell) postdoctoral advisor) wins the Nobel Prize in Chemistry (link). October, 2013: Adam receives the STARR Travel Grant (link) to attend the Biophysical Society Meeting in San Francisco, CA (link). September, 2013: Rongzhong's paper, "Computational and Experimental Characterizations of Silver Nanoparticle-Apolipoprotein Biocorona", is published in J. Phys. Chem. B (link). September, 2013: Cecilia joins the group. Welcome! August, 2013: The Computational Thinking @ Wake Workshop (link) is profiled by Wake Forest University (link). August, 2013: The 2nd Annual Google-sponsored Computational Thinking @ Wake Workshop for Teachers (link). Student volunteers included our own Andrew, Cody, and Julian. July, 2013: Andrew's and Cody's paper, "GPU-Optimized Hybrid Neighbor/Cell List Algorithm for Coarse-Grained MD Simulations of Protein and RNA Folding and Assembly", is published in Proceedings of the ACM Conference on Bioinformatics, Computational Biology and Biomedicine (link). July, 2013: Andrew's thesis is mentioned in NVIDIA's CUDA Week in Review Newsletter (link). May, 2013: Andrew successfully defends his Computer Science Dept. Master's Defense (link). May, 2013: Julian joins the group. Welcome! April, 2013: Adam is awarded a Wake Forest Research Fellowship (link). March, 2013: Cody is awarded a Wake Forest University Center for Molecular Communication and Signaling Research Fellowship (link). March, 2013: Google's CS4HS program selects Sam's proposal for developing a second computational thinking workshop for teachers (link). January, 2013: Alex Mackerell (University of Maryland, School of Pharmacy) visits the group and gives a joint Physics and Chemistry Department colloquium. His visit is highlighted in Wake Forest University's, Old Gold and Black student newspaper (link). January, 2013: Jessica joins the group. Welcome! January, 2013: Adam joins the group. Welcome! January, 2013: Cody joins the group. Welcome! December, 2012: Andrew's, Tyson's, and Anqi's paper entitled, "Performance Analyses of a Parallel Verlet Neighbor List Algorithm for GPU-Optimized MD Simulations", receives the Best Paper Award at the 2012 ASE/IEEE International Conference on Biomedical Computing (link). Only the top 7.5% of submitted manuscripts were accepted, and there was only one "best". December, 2012: Andrew's poster entitled, "Performance Analyses of a Parallel Verlet Neighbor List Algorithm for GPU-Optimized MD Simulations", is competitively selected for presentation at the GPU Technology Conference in San Jose, CA (March, 2013) (link). October, 2012: Tyson's and Anqi's paper is highlighted in GPU Science (link). October, 2012: Tyson's and Anqi's paper, "Parallel Verlet neighbor list algorithm for GPU-optimized MD simulations" is published in Proceedings of the ACM Conference on Bioinformatics, Computational Biology and Biomedicine (link). October, 2012: Rongzhong gives a talk to the Wake Forest University Center for Molecular Communcation and Signaling (link) Fall Retreat (link). September, 2012: Tyson's thesis is mentioned in NVIDIA's CUDA Week in Review Newsletter (link). September, 2012: Fox 8 News profiles the Wake@Hanes Computational Thinking Workshop (link). Andrew is interviewed. September, 2012: The Wake@Hanes Computational Thinking Workshop (link) is profiled by Wake Forest University (link). Andrew is interviewed for the article. August, 2012: Sam's NSF (CBET) proposal in collaboration with the research group of Pu-Chun Ke (Clemson Univ.) (link) is funded. 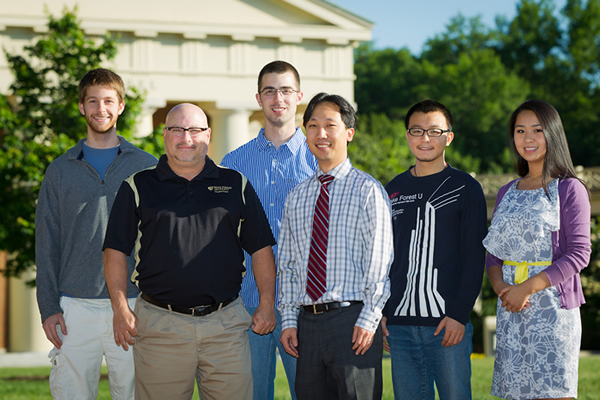 August, 2012: Wake Forest University is selected as CUDA Research Center by NVIDIA, Corp. (press release). August, 2012: Mashable (link) and the Huffington Post (link) selects Wake Forest University as one of the "Top 10 Colleges for Tech" and specifically highlights our recent Wake@Hanes Computational Thinking Workshop. August, 2012: The Inaugural Google-sponsored Wake@Hanes Computational Thinking Workshop for Teachers (link). Student volunteers included our own Andrew, Anqi, and Heming. June, 2012: News of our group's research is #4 on the ranking of top 10 Wake Forest sciences research stories of the 2011-2012 academic year (link). 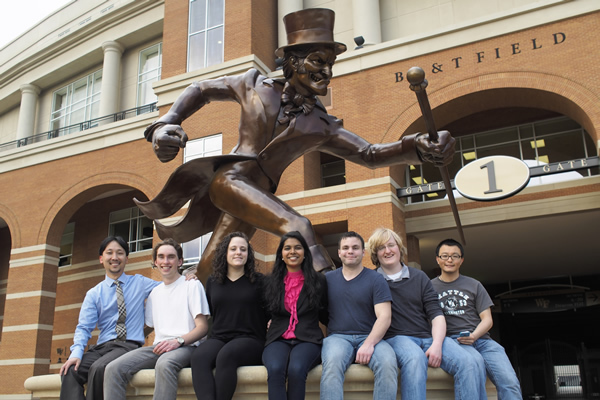 May, 2012: Heming Ge visits the group for the summer, and he is supported through the Wake Forest University Center for Molecular Communication and Signaling (link). Welcome! May, 2012: Our group's research is profiled in the Charlotte Observer (link) and News & Observer (link), North Carolina's largest and second largest newspapers, respectively. April, 2012: Tyson successfully defends his Computer Science Dept. Master's Defense (link). April, 2012: Anqi decides to attend Georgia Tech's Master's Program in Computational Science and Engineering. April, 2012: Google's CS4HS program selects Sam's proposal for developing workshop for a computational thinking workshop for teachers from Hanes Middle School. February, 2012: Anqi's and Tyson's poster entitled, "Single vs. Double Precision MD Simulations: Correlation is Length-Scale Dependent", is competitively selected for presentation at the GPU Technology Conference in San Jose, CA (May, 2012) (link). February, 2012: Fox 8 News profiles our research group. Tyson is interviewed (link). February, 2012: Anqi profiled by Old Gold and Black, Wake Forest University's Student Newspaper (link). February, 2012: Anqi profiled by Wake Forest University (link). February, 2012: Our group's research is profiled on Wired.co.uk (link). February, 2012: Andrew Proctor joins the group. Welcome! December, 2011: Sam's paper in collaboration with coworkers from University of Maryland and Zhejiang University (China) (link) is highlighted by the Journal of the American Chemical Society (link). December, 2011: Anqi Zou joins the group. Welcome! November, 2011: Sam writes a commentary in the journal Structure with WFU Physics Professor Martin Guthold (link) on the paper, "Mechanism of Fibrin(ogen) Forced Unfolding" by Barsegov and co-workers (link). September, 2011: Rongzhong Li joins the group. Welcome! July, 2011: Tyson's poster entitled, "GPU-Based Molecular Dynamic Simulations Optimized with CUDPP and CURAND Libraries", is competitively selected for presentation at the GPU Technology Conference in San Jose, CA (May, 2012) (link). May, 2011: Sam is awarded by the Wake Forest University Science Research Fund. 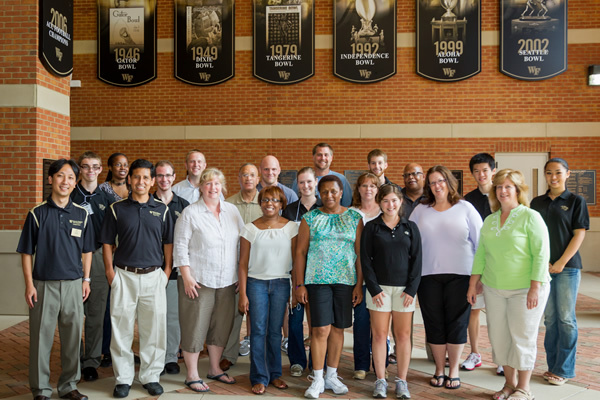 March, 2011: Wake Forest University is selected as CUDA Teaching Center by NVIDIA, Corp. (press release). Jan, 2011: Tyson Lipscomb joins the group. Welcome!